Background: Psychoeducational family intervention (PFI) has been proven to be effective in improving the levels of family burden and patients’ personal functioning in schizophrenia and bipolar disorders (BDs). Less is known about the impact of PFI on relatives’ coping strategies in BD. Methods: A multicenter, controlled, outpatient trial funded by the Italian Ministry of Health and coordinated by the Department of Psychiatry of the University of Campania “Luigi Vanvitelli” has been conducted in patients with bipolar I disorder (BD-I) and their key relatives consecutively recruited in 11 randomly selected Italian community mental health centers. We aim to test the hypothesis that PFI improves problem-oriented coping strategies in relatives of BD-I patients compared to the Treatment As Usual (TAU) group. Results: The final sample was constituted of 123 patients and 139 relatives. At baseline assessment (T0), the vast majority of relatives already adopted problem-oriented coping strategies more frequently than the emotion-focused ones. At the end of the intervention, relatives receiving PFI reported a higher endorsement of adaptive coping strategies, such as “maintenance of social interests” (odds ratio [OR]=0.309, CI=0.04–0.57; p=0.023), “positive communication with the patient” (OR=0.295, CI=0.13–0.46; p=0.001), and “searching for information” (OR=0.443, CI=0.12–0.76; p=0.007), compared to TAU relatives, after controlling for several confounders. As regards the emotion-focused coping strategies, relatives receiving the experimental intervention less frequently reported to adopt “resignation” (OR=-0.380, CI=-0.68 to -0.08; p=0.014) and “coercion” (OR=-0.268, CI=-0.46 to -0.08; p=0.006) strategies, compared to TAU relatives. Conclusion: PFI is effective in improving the adaptive coping strategies of relatives of BD-I patients, but further studies are needed for evaluating the long-term benefits of this intervention. Jönsson et al14 showed that relatives of BD patients receiving an educational intervention improve their coping strategies, and these results were confirmed in two other studies also.25,26 However, these findings came from clinical trials with a small sample size and were not implemented in real-world settings. Moreover, the PFI, according to the Falloon model,27 has been proven to be effective in improving adaptive coping strategies (such as positive communication and seeking for information) in relatives of patients with schizophrenia,28 but it has never been tested in relatives of BD patients. Within a multicenter study funded by the Italian Ministry of Health and coordinated by the University of Campania “Luigi Vanvitelli” on the evaluation of the efficacy of PFI for families of bipolar I disorder (BD-I) patients in the real-word setting, we aim to test the hypothesis that PFI is effective in improving problem-oriented coping strategies in a sample of relatives of BD-I patients compared to the Treatment As Usual (TAU) group. Inclusion criteria for patients were the following: 1) age between 18 and 65 years; 2) diagnosis of BD-I according to the Diagnostic and Statistical Manual of Mental Disorders-Fourth Edition (Text Revision) criteria;31 3) on the caseload of the local mental health center for at least 6 months, with a minimum of one contact per month in the last 12 months; 4) at least one affective episode in the past 3 years; 5) living with at least one relative; and 6) providing informed consent to participate in the study and to involve their relatives. Relatives’ inclusion criteria were: 1) age between 18 and 70 years, and 2) absence of any disabling physical or mental disorder. According to the study’s protocol, each participating center was expected to recruit at least 16 families of BD patients. Patients and their key relatives who agreed to participate in the study were consecutively allocated to the experimental group (up to eight families per center), or to a waiting list, receiving the intervention at the end of the study (TAU).29,30 A consecutive recruitment procedure was adopted for reducing the contamination between subjects in the study centers. The intervention consists of three or four informative sessions, at least four communication skills sessions, and two or three problem-solving sessions. Sessions take place three times a month for a period ranging from 4 to 6 months (about 18 sessions in total). Each session lasts about 90 minutes. Site and frequency of sessions are adapted to families’ needs and mental health professionals’ duties and workloads. The Falloon intervention has been adapted to BD-I by our research group with the following methodology: 1) analysis of scientific literature; 2) evaluation of available handbooks and manuals on psychoeducational approaches for BD-I;33–37 and 3) focus groups with research researchers and clinical experts and with users and carers, in order to identify the most relevant components to be included in the intervention. The intervention was discontinued if the following occurred: 1) patients or relatives were unable to attend more than five psychoeducational sessions; or 2) patients were hospitalized or had any affective relapse during the intervention; or 3) patients or relatives withdrew their consent. In both groups, patients continued to receive the treatment usually provided in their center. Herein, we address a new research question on the efficacy of the PFI – according to the Falloon model27 – in improving relatives’ coping strategies. Patients’ clinical status was assessed with the 24-items Brief Psychiatric Rating Scale (BPRS);41 for the purposes of this study, we used the BPRS depressive-anxiety and manic/hostility subscales. Patients’ social functioning was assessed by the Disability Assessment Schedule,42 with higher scores indicating a worse social functioning. Pharmacologic treatment was considered adequate if at least one mood stabilizer or one antipsychotic drug was prescribed to patients, according to the National Institute for Health and Care Excellence guidelines for the treatment of BD.22 Pharmacologic treatment was maintained stable as much as possible in the two groups over the intervention period. Patients’ clinical and sociodemographic characteristics, as well as relatives’ sociodemographic characteristics at the baseline were recorded by ad hoc schedules. In both groups, patients continued to receive the treatment usually provided in their center. Patients and relatives were assessed prior to the beginning of the intervention (T0 assessment) and at the end of the intervention (T1 assessment). The study was conducted in accordance with the ethical principles of the Declaration of Helsinki. All patients and relatives received detailed information on the study and provided written informed consent. The protocol was submitted to and approved by the Ethical Committee of the University of Campania “Luigi Vanvitelli”. Per-protocol analysis – including only those patients who completed the treatment originally allocated to – was implemented in order to evaluate the effects of treatments in the real-world setting. Making an imputation of the missing values would be out of interest of a real-world study. Frequency counts and descriptive analyses were performed, as appropriate. Baseline differences in socio-demographic and clinical characteristics were tested using χ2 or Student’s t-test, as appropriate. In each group, the impact of the experimental intervention and of TAU on relatives’ coping strategies was explored by Student’s t-test for paired samples. Moreover, in order to reduce type 1 error, bootstrap calculation with 1,000 bootstrap replications was implemented and 95% CI values of bootstrap were reported. Correlations between coping strategies and relatives’ sociodemographic characteristics, as well as between coping strategies and patients’ clinical characteristics were explored using the Spearman correlation. In order to test the efficacy of the experimental intervention on coping strategies, linear regression models were implemented, using the mean score of the FCQ subscales as outcome measures. In particular, the mean score of each FCQ subscale (eg, FCQ – collusion) was used as a continuous variable, and having received or not the experimental intervention was entered as the main predictor (considered as binary variable “Yes vs No”). Each regression model was controlled for patients’ clinical and sociodemographic variables (ie, patient’s age, gender, years of school, duration of illness, mean scores of BPRS subscales at baseline, Disability Assessment Schedule global score at baseline) and relatives’ sociodemographic characteristics (ie, age, gender, type of relationship with the patient, years of cohabiting with the patient, daily hours spent in contact with the patient, being part of the same nuclear family) identified from the relevant literature in the field.16 Data analysis was performed using SPSS statistical software, version 18.0;47 a two-tailed alpha level of significance was set at p<0.05. One center out of the 11 involved did not run the intervention after training of mental health professionals. The remaining 10 centers were expected to recruit up to 16 patients with BD-I and their key relatives. Of the 143 contacted families, six refused due to lack of time or current family conflicts. Of the remaining 137 families, 70 were consecutively allocated to the experimental group and 67 to the control group. In the experimental group, 10 families dropped out during the intervention phases, with a retention rate of 93% (final study sample of 60 families). In the control group, four families dropped out during the study, with a retention rate of 94% (final study sample of 63 families). The final sample consisted of 123 patients and 139 relatives, of whom 60 patients and 72 relatives were allocated to the experimental group and 63 patients and 67 relatives to the control group. Sixty-eight relatives out of 139 (49%) reported to have children. Also, 45.6% of them were underage and were not included in the study. Patients’ and relatives’ sociodemographic characteristics as well as patients’ clinical features are reported in Table 1. Notes: Mean score of each subscale is reported; score ranges from 1 (never) to 4 (always) with higher score indicating higher endorsement of each strategy. Significant p-values have been highlighted in bold characters. Abbreviations: BPRS, Brief Psychiatric Rating Scale; DAS, Disability Assessment Schedule; FCQ, Family Coping Questionnaire; M, mean score; SD, standard deviation; MHC, mental health center; NA, not applicable. The most frequently adopted coping strategy was positive communication with the patient (3.1±0.6), followed by patients’ involvement in social activities (3.0±0.7), maintenance of social interests (2.6±0.8), and seeking for information (2.3±1.0). Emotion-focused coping strategies, such as collusion (2.1±0.4), coercion (2.0±0.6), resignation (2.0±0.9), and spiritual help (2.0±1.1), were less frequently adopted. 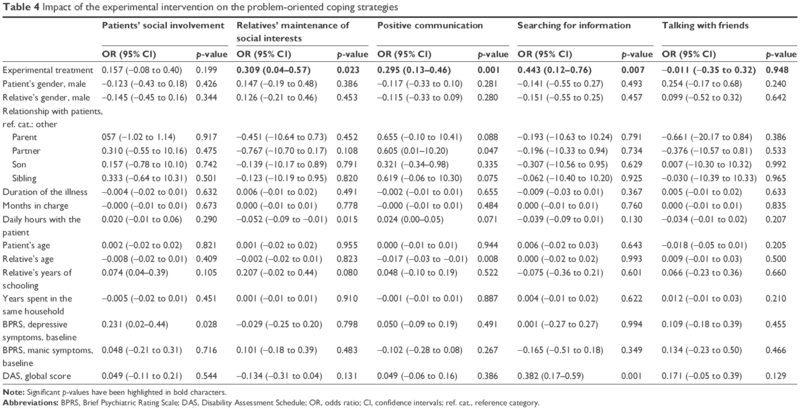 At baseline, no statistically significant difference in coping strategies was found between the two groups (Table 1). 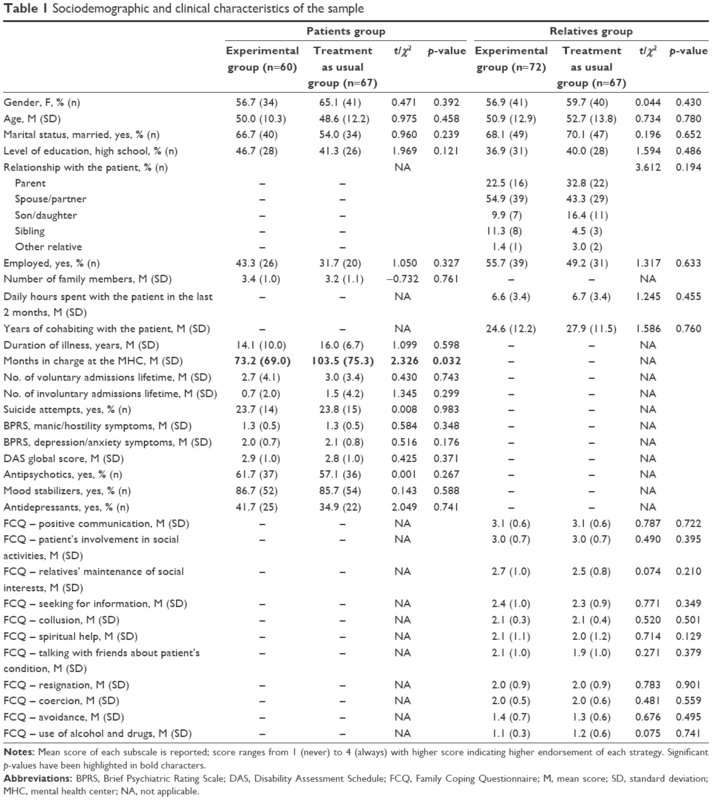 According to the correlation analyses (Table 2), patients’ involvement in social activities was positively associated with a higher educational level of relatives (ρ=0.183, p=0.031) and better psychosocial functioning of patients (ρ=−0.359, p=0.0001). Maintenance of social interests was positively associated with relatives’ level of education (ρ=0.297, p=0.0001) and patients’ social functioning (ρ=−0.358, p=0.0001), and negatively correlated with patients’ depressive symptoms (ρ=−0.187, p=0.021). Seeking for information was associated with worse social functioning of the patients (ρ=0.479, p=0.0001), while talking with friends was associated with a better level of patients’ social functioning (ρ=−0.253, p=0.0001). Notes: Mean score of each subscale is reported; score ranges from 1 (never) to 4 (always), with higher score indicating higher endorsement of each strategy. Significant p-values have been highlighted in bold characters. Abbreviations: ρ, rho coefficient; FCQ, Family Coping Questionnaire. Collusion was positively associated with relatives’ older age (ρ=0.328, p=0.0001), a lower level of education (ρ=−0.172, p=0.042), and more years of cohabiting with the patient (ρ=0.171, p=0.045). Coercion, avoidance, and resignation were more frequently adopted by relatives of patients with higher levels of symptoms of the two BPRS subscales and with worse social functioning (Table 2). 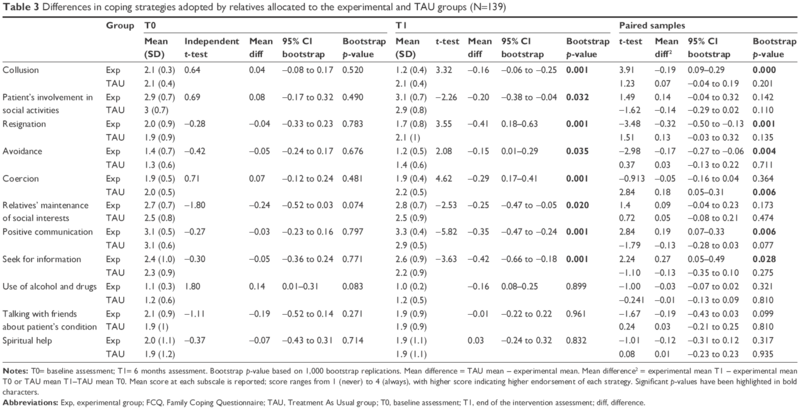 At the end of the intervention, the t-test for independent samples along with 95% CI bootstrap highlighted that relatives in the experimental group endorsed, more frequently, a positive communication strategy compared with those in the TAU group, with a mean difference of 0.35 (95% CI: 0.47–0.24; p=0.001). Moreover, relatives receiving the PFI reported a higher endorsement of seeking for information (mean difference: 0.42, 95% CI: 0.66–0.18; p=0.001), maintenance of social interests (mean difference: 0.25, 95% CI: 0.47–0.05; p=0.020), and patient’s social involvement (mean difference: 0.20, 95% CI: 0.38–0.04; p=0.032), compared with relatives from the control group. As regards the emotion-focused strategies, relatives from the PFI group reported a significant reduction in collusion (mean difference: −0.16, 95% CI: −0.06 to −0.25; p=0.001), resignation (mean difference: −0.41, 95% CI: −0.18 to −0.63; p=0.001), avoidance (mean difference: −0.15, 95% CI: −0.01 to −0.29; p=0.035), and coercion (mean difference: −0.29, 95% CI: −0.17 to −0.41; p=0.001), compared with relatives from the TAU group (Table 3). Notes: T0= baseline assessment; T1= 6 months assessment. Bootstrap p-value based on 1,000 bootstrap replications. Mean difference = TAU mean – experimental mean. Mean difference2 = experimental mean T1 – experimental mean T0 or TAU mean T1–TAU mean T0. Mean score at each subscale is reported; score ranges from 1 (never) to 4 (always), with higher score indicating higher endorsement of each strategy. Significant p-values have been highlighted in bold characters. Abbreviations: Exp, experimental group; FCQ, Family Coping Questionnaire; TAU, Treatment As Usual group; T0, baseline assessment; T1, end of the intervention assessment; diff, difference. When considering t-test for paired samples, we found that only positive communication (mean difference: 0.19, 95% CI: 0.07–0.33; p=0.006) and seeking for information (mean difference: 0.27, 95% CI: 0.05–0.49; p=0.028) strategies significantly improved over time in relatives receiving the experimental intervention. As regards the emotion-focused strategies, only collusion (mean difference: −0.19, 95% CI: 0.09–0.29; p=0.000), resignation (mean difference: −0.32, 95% CI: −0.50 to −0.13; p=0.001), and avoidance (mean difference: −0.17, 95% CI: −0.27 to −0.06; p=0.004) were reduced over time in relatives receiving the PFI (Table 3). Regarding the impact of the intervention on relatives’ coping strategies, family members receiving the experimental intervention reported higher score in the “maintenance of social interests” subscale (odds ratio [OR]=0.309, CI=0.04–0.57; p=0.023), “positive communication” subscale (OR=0.295, CI=0.13–0.46; p=0.001), and the “searching for information” subscale (OR=0.443, CI=0.12–0.76; p=0.007), after controlling for confounders (Table 4). As regards the emotion-focused coping strategies, relatives receiving the experimental intervention reported lower scores in “resignation” (OR=−0.380, CI=−0.68 to −0.08; p=0.014), “coercion” (OR=−0.268, CI=−0.46 to −0.08; p=0.006), and “use of alcohol and drugs” subscales (OR=−0.182, CI=−0.33 to −0.04; p=0.014), after controlling for confounders (Table 5). Note: Significant p-values have been highlighted in bold characters. Abbreviations: BPRS, Brief Psychiatric Rating Scale; DAS, Disability Assessment Schedule; OR, odds ratio; CI, confidence intervals; ref. cat., reference category. Notes: Mean score at each subscale is reported; score ranges from 1 (never) to 4 (always), with higher score indicating higher endorsement of each strategy. Significant p-values have been highlighted in bold characters. Abbreviations: BPRS, Brief Psychiatric Rating Scale; DAS, Disability Assessment Schedule; OR, odds ratio. The main findings of our study are the following: 1) relatives of patients with BD tend to adopt, more frequently, problem-oriented coping strategies, such as positive communication, patients’ involvement in social activities, maintenance of social interest, and seeking for information, than emotion-focused ones such as collusion, coercion, resignation, and spiritual help; 2) relatives’ coping strategies are strongly correlated with patients’ symptoms severity and psychosocial functioning; and 3) relatives receiving PFI show a significant reduction in the adoption of emotion-focused strategies and an increase in problem-oriented ones. This study has several strengths that are already acknowledged, and some limitations. The first is that relatives’ coping strategies have been evaluated through a single self-reported questionnaire. However, the FCQ is a well-known questionnaire with good psychometric properties, which has been used in previous studies involving relatives of patients with severe mental disorders.38–40 The second limitation is that patients’ symptoms were tested with the BPRS, instead of more specific tools for affective symptoms. However, this choice was due to the fact that the BPRS is a very well-known, easy-to-use, and reliable instrument that can be adopted in ordinary settings by mental health professionals with a relatively short period of training. The third limitation of the study is the lack of randomization of patients and the relatively small sample size. This was intended as a “real-world” study, and the efficacy of the experimental intervention was tested in the routine care of Italian mental health centers. However, the purposive sampling and the per-protocol analysis adopted may have biased the results, but the sample representativeness has been preserved by the random selection of the participating centers. Moreover, in order to enhance fidelity to real-world settings, per-protocol methodology was adopted, and the imputation of missing data would not have been appropriate for this study. Another possible limitation is the exclusion of underage children and not-cohabiting close relatives from the intervention. This choice may have limited the generalizability of the results, since quite often, BD patients live with their underage children. However, this choice was due to the fact that we aimed to explore the effect of the PFI on adult relatives, and we aim to analyze the effect of BD on underage children in future studies. Moreover, the main aim of this study was to evaluate the efficacy of the PFI according to the Falloon model in coping strategies of those relatives cohabiting with the patient. PFI is effective in improving problem-oriented coping strategies in family members of patients with BD. This is a very relevant issue since adaptive coping strategies are essential for improving the level of family functioning and, consequently, to improve the long-term course of patients with BD. These findings further support the importance to routinely provide PFI to patients and family members. Further steps should be focused on the assessment of the level of satisfaction of users and carers with these kinds of interventions. In fact, as recently pointed out in a survey carried out with all the categories of stakeholders involved in mental health, there is the need to include users’ perspective in research studies59–62 and to promote shared decision making63–69 in order to develop a more person-centered approach.70–72 Finally, long-term studies can help to evaluate the stability of adaptive coping strategies over time, since these can change as the illness progresses. The research project has been funded by the Italian Ministry of Health (registration number: 9556/2009). AF designed the study and wrote the protocol. AF, VDV, ML, CDR, and CM organized the training and supervision for mental health professionals and coordinated the activities with participating mental health centers. GS, ML, and AT managed the literature searches and analyses. FB, GC, SI, DL, AM, FB, FV, LS, SF, SB, MP, EP, VG, and GB recruited patients and key relatives, carried out the intervention in their center, and coordinated the study in their center. GS, ML, and GC undertook the statistical analyses. ML, GS, VDV, AT, and AF wrote the first draft of the manuscript. All authors contributed toward data analysis, drafting and revising the paper and agree to be accountable for all aspects of the work. Miklowitz DJ, Goldstein MJ, Nuechterlein KH, Snyder KS, Mintz J. Family factors and the course of bipolar affective disorder. Arch Gen Psychiatry. 1988;45:225–231. Miklowitz DJ, Goldstein MJ. Behavioral family treatment for patients with bipolar affective disorder. Behav Modification. 1990;14:457–489. Fadden G, Bebbington P, Kuipers L. The burden of care: the impact of functional psychiatric illness on the patient’s family. Br J Psychiatry. 1987;150:285–292. Miklowitz D, Chung B. Family-focused therapy for bipolar disorder: reflections on 30 years of research. Fam Proc. 2016;55:483–499. Brown GW, Birley JLT, Wing JK. Influence of family life on the course of schizophrenic disorder. Br J Psychiatry. 1972;121:241–258. Nehra R, Chakrabarti S, Kulhara P, Sharma R. Caregiver-coping in bipolar disorder and schizophrenia–a re-examination. Soc Psychiatry Psychiatr Epidemiol. 2005;40:329–336. McGirr A, Karmani S, Arsappa R, et al. Clinical efficacy and safety of repetitive transcranial magnetic stimulation in acute bipolar depression. World Psychiatry. 2016;15:85–86. Hayes JF, Marston L, Walters K, Geddes JR, King M, Osborn DP. Lithium vs. valproate vs. olanzapine vs. quetiapine as maintenance monotherapy for bipolar disorder: a population-based UK cohort study using electronic health records. World Psychiatry. 2016;15:53–58. Fiorillo A, Sampogna G, Del Gaudio L, Luciano M, Del Vecchio V. Efficacy of supportive family interventions in bipolar disorder: a review of the literature. J Psychopatol. 2013;19:134–142. van der Voort TY, Goossens PJ, van der Bijl JJ. Burden, coping and needs for support of caregivers for patients with a bipolar disorder: a systematic review. J Psychiatr Ment Health Nurs. 2007;14:679–687. Luciano M, Del Vecchio V, Sampogna G, De Rosa C, Fiorillo A. Including family members in psychoeducation for bipolar disorder: is it worth it? Bipolar Disord. 2015;17:458–459. Wasley D, Eden S. Predicting psychological distress of informal carers of individuals with major depression or bipolar disorder. Int J Ment Health Nurs. 2018;27(1):358–367. Goossens PJ, Van Wijngaarden B, Knoppert-van Der Klein EA, Van Achterberg T. Family caregiving in bipolar disorder: caregiver consequences, caregiver coping styles, and caregiver distress. Int J Soc Psychiatry. 2008;54:303–316. Jönsson PD, Wijk H, Danielson E, Skärsäter I. Outcomes of an educational intervention for the family of a person with bipolar disorder: a 2-year follow-up study. J Psychiatr Ment Health Nurs. 2011;18:333–341. Lazarus RS, Folkman S. Stress, Appraisal and Coping. New York, NY: Springer; 1984. Chakrabarti S, Gill S. Coping and its correlates among caregivers of patients with bipolar disorder: a preliminary study. Bipolar Disord. 2002;4:50–60. Rea MM, Tompson MC, Miklowitz DJ, Goldstein MJ, Hwang S, Mintz J. Family focused treatment vs. individual treatment for bipolar disorder: results of a randomized clinical trial. J Consult Clin Psychol. 2003;71:482–492. Reinares M, Colom F, Rosa AR, et al. The impact of staging bipolar disorder on treatment outcome of family psychoeducation. J Affect Disord. 2010;123:81–86. Reinares M, Colom F, Sánchez-Moreno J, et al. Impact of caregiver group psychoeducation on the course and outcome of bipolar patients in remission: a randomized controlled trial. Bipolar Disord. 2008;10:511–519. Camardese G, Vasale M, D’Alessandris L, et al. A Mixed program of psychoeducational and psychological rehabilitation for patients with bipolar disorder in a day hospital setting. J Nerv Ment Dis. Epub 2018 Feb 6. Dean OM, Gliddon E, Van Rheenen TE, et al. An update on adjunctive treatment options for bipolar disorder. Bipolar Disord. Epub 2018 Jan 25. National Institute for Health and Care Excellence (NICE). Bipolar disorder: assessment and management; 2014. Available from: https://www.nice.org.uk/guidance/cg185/chapter/1-Recommendations#care-for-adults-children-and-young-people-across-all-phases-of-bipolar-disorder-2. Accessed August 17, 2017. Salcedo S, Gold AK, Sheikh S, et al. Empirically supported psychosocial interventions for bipolar disorder: current state of the research. J Affect Disord. 2016;201:203–214. Bond K, Anderson IM. Psychoeducation for relapse prevention in bipolar disorder: a systematic review of efficacy in randomized controlled trials. Bipolar Disord. 2015;17:349–362. Perlick DA, Miklowitz DJ, Lopez N, et al. Family-focused treatment for caregivers of patients with bipolar disorder. Bipolar Disord. 2010;12:627–637. Eisner LR, Johnson SL. An acceptance-based psychoeducation intervention to reduce expressed emotion in relatives of bipolar patients. Behav Ther. 2008;39:375–385. Falloon IRH. Family Management of Schizophrenia: A Controlled Study of Clinical, Social, Family and Economic Benefits. Baltimore, MD: John Hopkins University Press; 1985. Magliano L, Fadden G, Economou M, et al. Family burden and coping strategies in schizophrenia: 1-year follow-up data from the BIOMED I study. Soc Psychiatry Psychiatr Epidemiol. 2000;35:109–115. Fiorillo A, Del Vecchio V, Luciano M, et al. Efficacy of psychoeducational family intervention for bipolar I disorder: a controlled, multicentric, real-world study. J Affect Disord. 2015;172:291–299. Fiorillo A, Del Vecchio V, Luciano M, et al. Feasibility of a psychoeducational family intervention for people with bipolar I disorder and their relatives: results from an Italian real-world multicentre study. J Affect Disord. 2016;190:657–662. American Psychiatric Association. Diagnostic and Statistical Manual of Mental Disorders. 4th ed. text rev. Washington, DC: American Psychiatric Association; 2000. Magliano L, Fadden G, Economou M, et al. Social and clinical factors influencing the choice of coping strategies in relatives of patients with schizophrenia: results of the BIOMED I study. Soc Psychiatry Psychiatr Epidemiol. 1998;33:413–419. Goldberg JF, Harrow M. Bipolar Disorders. Washington DC: American Psychiatric Press; 1998. Jones S, Hayward P, Lam D. Coping with Bipolar Disorder–A Guide to Living with Manic Depression. Oxford: One Word Publications; 2002. Miklowitz DJ. The Bipolar Disorder Survival Guide: What You and Your Family Need to Know. New York, NY: Guildford Press; 2002. Colom F, Vieta E. Manual de Psicoeducacìon para el Trastorno Bipolar. [Handbook of psychoeducation for bipolar disorder] Barcelona: Ars medica; 2004. Spanish. McDonald C, Schulze K, Murray MR, Tohen M. Bipolar Disorder. London: Taylor and Francis Group; 2005. Magliano L, Guarneri M, Marasco C, Tosini P, Morosini PL, Maj M. A new questionnaire assessing coping strategies in relatives of patients with schizophrenia: development and factor analysis. Acta Psychiatr Scand. 1996;94:224–228. Fiorillo A, Sampogna G, Luciano M, et al. How do relatives cope with eating disorders? Results from an Italian multicentre study. Int J Eat Disord. 2017;50:587–592. Fiorillo A, Sampogna G, Del Vecchio V, et al. Development and validation of the Family Coping Questionnaire for Eating Disorders. Int J Eat Disord. 2015;48:298–304. Lukoff D, Nuechterlein KH, Ventura J. Appendix A: manual for expanded Brief Psychiatric Rating Scale (BPRS). Schizophr Bull. 1986;12:594–602. Magliano L, Fiorillo A, Malangone C, De Rosa C, Maj M; Family Intervention Working Group. Implementing psychoeducational interventions in Italy for patients with schizophrenia and their families. Psychiatr Serv. 2006;57:266–269. Del Vecchio V, Luciano M, Malangone C, et al. Implementing family psychoeducational intervention for bipolar I disorder in 11 Italian Mental Health Centres. J Psychopathol. 2011;17:277–282. Candini V, Buizza C, Ferrari C, et al. Is structured group psychoeducation for bipolar patients effective in ordinary mental health services? A controlled trial in Italy. J Affect Disord. 2013;151:149–155. Pingani L, Fiorillo A, Luciano M, et al. Who cares for it? How to provide psychosocial interventions in the community. Int J Soc Psychiatry. 2013;59:701–705. SPSS Inc. 2009. PASW Statistics for Windows, Version 18.0. Chicago: SPSS Inc.
Fiorillo A, Bassi M, de Girolamo G, Catapano F, Romeo F. The impact of a psychoeducational intervention on family members’ views about schizophrenia: results from the OASIS Italian multi-centre study. Int J Soc Psychiatry. 2011;57:596–603. Luciano M, Sampogna G, del Vecchio V, et al. The family in Italy: cultural changes and implications for treatment. Int Rev Psychiatry. 2012;24:149–156. Bhugra D, Fiorillo A. Families, functioning and therapies. Int Rev Psychiatry. 2012;24:79–80. Luciano M, Del Vecchio V, Giacco D, De Rosa C, Malangone C, Fiorillo A. A ‘family affair’? The impact of family psychoeducational interventions on depression. Expert Rev Neurother. 2012;12:83–91. Ruffolo MC, Nitzberg L, Schoof K. One-session family workshops for bipolar disorder and depression. Psychiatr Serv. 2011;62:323. Vieta E. Improving treatment adherence in bipolar disorder through psychoeducation. J Clin Psychiatry. 2005;66:24–29. Southwick SM, Sippel L, Krystal J, Charney D, Mayes L, Pietrzak R. Why are some individuals more resilient than others: the role of social support. World Psychiatry. 2016;15:77–79. O’Brien MP, Miklowitz DJ, Candan KA, et al. A randomized trial of family focused therapy with populations at clinical high risk for psychosis: effects on interactional behavior. J Consult Clin Psychol. 2014;82:90–101. Perlick DA, Rosenheck RR, Clarkin JF, Raue P, Sirey J. Impact of family burden and patient symptom status on clinical outcome in bipolar affective disorder. J Nerv Ment Dis. 2001;189:31–37. Reinares M, Sánchez-Moreno J, Fountoulakis KN. Psychosocial interventions in bipolar disorder: what, for whom, and when. J Affect Disord. 2014;156:46–55. Fiorillo A, Luciano M, Del Vecchio V, et al. Priorities for mental health research in Europe: a survey among national stakeholders’ associations within the ROAMER project. World Psychiatry. 2013;12:165–170. Forsman AK, Wahlbeck K, Aarø LE, et al. Research priorities for public mental health in Europe: recommendations of the ROAMER project. Eur J Public Health. 2015;25:249–254. Wykes T, Haro JM, Belli SR, et al. Mental health research priorities for Europe. Lancet Psychiatry. 2015;2:1036–1042. Stein DJ. Psychiatric practice: caring for patients, collaborating with partners, or marketing to consumers? World Psychiatry. 2017;16:156–157. Coulter A. Shared decision making: everyone wants it, so why isn’t it happening? World Psychiatry. 2017;16:117–118. Slade M. Implementing shared decision making in routine mental health care. World Psychiatry. 2017;16:146–153. Tse S. Shared decision making in mental health care settings: perspective, purpose and practice. World Psychiatry. 2017;16:158–160. McCabe R. Involvement in decision making: the devil is in the detail. World Psychiatry. 2017;16:155–156. Scholl I, Barr PJ. Incorporating shared decision making in mental health care requires translating knowledge from implementation science. World Psychiatry. 2017;16:160–161. Freidl M, Pesola F, Konrad J, et al. Effects of clinical decision topic on patients’ involvement in and satisfaction with decisions and their subsequent implementation. Psychiatr Serv. 2016;67:658–663. Puschner B, Becker T, Mayer B, et al. Clinical decision making and outcome in the routine care of people with severe mental illness across Europe (CEDAR). Epidemiol Psychiatr Sci. 2016;25:69–79. Uher R. Person-centered measurement-based care for depression. World Psychiatry. 2016;15:238–239. El Chammay R. A policy implementer’s perspective. World Psychiatry. 2017;16:43–44. Sunkel C. A service user’s perspective. World Psychiatry. 2017;16:44–45.